Current and former UMW students are instrumental to FOR’s efforts. Working the Riverfest 2018 Outreach & Membership booth, from left, are Lisa Marie King ’19, Celeste Wilson ’18, and Hailey Hopkins ’19. It would be hard to overstate the impact volunteers have on Friends of the Rappahannock (FOR). A staff of just over a dozen individuals can only accomplish so much, no matter how dedicated they are. It takes caring people from throughout the watershed to make FOR the Voice and Active Force for a healthy and scenic Rappahannock River. Over the course of a calendar year, hundreds of volunteers contribute many hours of valuable service to FOR. In 2018 they picked up more than 11,000 pounds of trash from the banks of the river and its tributaries. They facilitated outreach events and interpretive trips. They planted trees, replenished oyster beds, and helped maintain our property and our building. 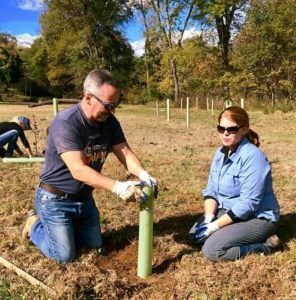 In total, volunteers contributed more than 4,000 hours to FOR in 2018. Without volunteers, FOR could not accomplish what it does. FOR volunteers bring a diversity of experience to our work. There are University of Mary Washington (UMW) professors who serve on our executive committee. Other faculty members advise us about programs like Life Along the Rappahannock oral histories, biological research, and Nuestro Rappahannock, our Latino community outreach program. UMW students annually contribute even more hours than their professors. Dozens of students helped this year with outreach events like the Wild & Scenic Film Festival, Earth Day, and Riverfest. This fall we have five UMW seniors earning academic credit for their hard work. They include Spanish language translator Lisa Marie King, historian Madeleine McCullough, environmental scientist Sarah Jordan, and biologists Asher Gambale and Hailey Hopkins. As FOR’s volunteer coordinator, I get to work first-hand with many of these amazing people. I want to briefly introduce you to a few of them. I hope their stories inspire you the way they inspire me. I first met Jackie Bucher in the spring of 2016. Jackie was a student at UMW, with a full-time job, working her way to a biology degree. Jackie graduated in 2017 and has since volunteered more than 100 hours with interpretive trips and events like the Civil War Paddle, Hunter’s Island Hike, and Riverfest. Jackie’s experience is invaluable as a leader with a can-do attitude Lately, Jackie has introduced Jeffrey Freese to FOR. Together they can do anything and I always give them the hard jobs. Celeste Wilson graduated from UMW with a biology degree in May 2018, but she hasn’t cut her ties to FOR. 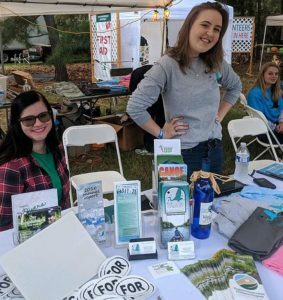 One of our “go-to” student interns during her junior and senior years of college, Celeste was with us throughout this past summer, at events like Earth Day and the Moonlight Paddle. She has served more than 400 hours with FOR, and was a rock at Riverfest 2018, helping run our outreach and membership booth. Like a lot of our student volunteers, Celeste has become a valued member of the FOR family. Speaking of Riverfest, more than 150 volunteers of all ages and from many backgrounds helped make our annual “Good Party for a Great Cause” a tremendous success in 2018. Riverfest volunteers working the day of the event totaled nearly 500 hours of service to FOR. Volunteer Keith Homza, left, is an active participant with FOR’s restoration program. Jennifer Gron is an environmental educator with FOR. I help with a lot of our buildings and grounds maintenance. For the past five years, Ben Raterman has been Mr. Reliable. He’s always willing to get his hands dirty, and enjoys working with students on projects like Trout in the Classroom, bird counts, and installing our river safety gauge. In 2018, Ben helped clean up trees that were downed by a spring windstorm, and a few months later helped repair the damage they caused to our office building. He’s also a member of our executive committee, providing leadership for all of FOR’s work. Ian Littlejohn is a lot like Ben. He, too, likes construction projects, from designing stormwater drainage systems to installing lights for our parking lot and tool sheds. In 2018 Ian brought his considerable talent to Riverfest (again). He also brought his Gator and trailer, and a hard-working cousin, so we could more easily move the hundreds of tables and chairs that go under the tents. Ian is always willing to tackle the difficult jobs, and we appreciate his support. These are just a few of the people who made 2018 an incredibly successful and rewarding year at FOR. This list is by no means inclusive, and I run the risk of forgetting someone special. I didn’t detail the dozens of hours Mike Logan and Logan Electric devoted to providing power for Riverfest, or the way Mats Jerndal and OddBox Studios showed up the day of Riverfest to take pictures, and was instantly one of the most popular attractions for attendees. 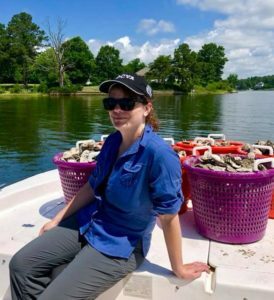 FOR volunteer Leandra Jacobson helped restore oyster reefs in the tidal Rappahannock in 2018. Keith Homza is a mainstay of our water quality monitoring program, and a frequent flier with our restoration projects, like tree plantings. Janet Wright has for years been part of our outreach team, leading educational exhibits for students throughout the middle watershed. She’s also active in environmental advocacy. There are high school students like Eva Kerr, who worked five river cleanups and tree plantings this year. And middle school students like Lauren Morse, who helped with half a dozen outreach events… it is a long and substantial list, and FOR is lucky to have them all. Each year we seem to do more. More trees planted, more trash removed, more young people attending our education classes. It is all made possible by our many outstanding volunteers. FOR is grateful for you all. And if I didn’t mention your name, please know we genuinely appreciate everything you do to make FOR a success.